I am out of the house at the moment, and Rich is with all our furries and continuing with the many things we have to do in the house. It is important to explain that in the downstairs part of our house we have the kitchen, with a large utility,pantry room behind it, that leads down to the cellar, the loo (under the stairs) and a very large living room, which had originally been two rooms some time in the past. So we have two main rooms really, the kitchen and the living room. Due to this the living room has to be our office, dining room and lounge. A room of many uses but plenty big enough to cater for them all. However….. we do not need a large dining table because we would prefer to have another seating area where people can sit and read. (Or in our case as the only people, other than when people visit, are Rich and I somewhere where we can sit if we don’t fancy watching the telly. Or the cats seating area as it is right by a window and the chairs are often bathed in sunlight). One of the things I love about living over here is that it has made me think about everything I use, and how nothing should go to waste. Rich is in the same mind so we decided to use a spare work top that we have left over from our kitchen renovations, and turn it into a table. We sourced some wooden legs from the local DIY (or brico store as it is called. Brico meaning do it yourself basically) we then decided they were too expensive and I left it in Rich’s capable hands to pick some that were cheaper. He was so pleased with himself when he called me to say that he had not only found some legs but that each leg was over 15 euro cheaper than the original wooden ones we had originally looked at, 4 euro each! The catch – they were metal. But this did not deter him as he knew that I had just the paint to paint them grey (my favourite colour) and make them look, in homage to my Essex readers, cushty. I congratulated him on such a wonderful find and off he went to make our table. Later I received a call to tell me that the he had made the table, but that the legs were “stupid! Too f******** long” and that he did not know how anyone would be able to sit at a table because it was too high. I laughed and said that they could not be that long, how long were they? He went on to explain the the chairs fitted all the way under the table and that it come up to his chest when seated (he is over 6’1″) and that if I sat at the table it I would look like Alice in wonderland, have my chin on the table, and not be able to eat my dinner. At this point I was now wetting myself laughing, especially as one my husbands names for me is inch eye private eye! I imagined myself sitting at this table with my little face peaking over like a naughty little girl. He was not amused. Lo and behold today it is fixed. 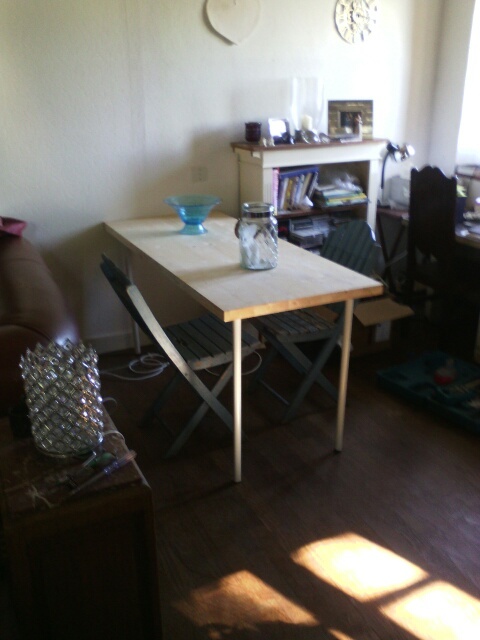 Bear with me, the legs are not painted, and the top is not stained, but it is a table that is the right size for our room for a total of 29 euro, as the worktop only cost us 13 euro. See it came right in the end!!! Please excuse the furniture layout, the living room is not decorated, and the book case is on death row. But bless him he has put a hurricane lamp and a dish on it! !